Two tries either side of half-time put Canberra Raiders on course for a 21-0 round one victory over the Titans at Cbus Super Stadium. The Green Machine kept a clean sheet in a game where slippy conditions made play difficult. Gold Coast suffered a blow before kick-off when halfback Ash Taylor was ruled out with a quadriceps injury and, just 12 minutes into the game, five-eighth Tyrone Roberts was forced off with a suspected Achilles injury. Canberra posted the first try of the match just 15 seconds before the interval through Sia Soliola, Jarrod Croker adding the extras to make it 10-0. Three minutes into the second stanza they grabbed their second when Joseph Leilua powered over the line. Bailey Simonsson's try pushed the lead out to 18-0 midway through the half with Croker kicking three penalty goals and Aidan Sezer adding a field goal. The Titans' cohesion was affected by the absence of two playmakers, which forced a reshuffle of the back line where Tyrone Peachey joined AJ Brimson in the halves and Dale Copley came on at left centre. Gold Coast had their chances, particularly in the second half, but the visitors were unable to complete enough of their sets and they couldn't find a way through the Raiders defence. Brimson thought he had scored 18 minutes from the end but a pass from Brenko Lee was ruled forward. 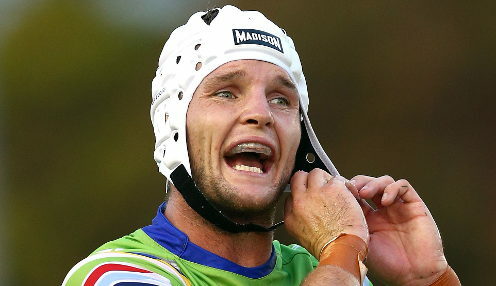 English back-rower John Bateman, on his NRL bow for Canberra, logged 145 run metres, 36 tackles and five tackle busts. The 25-year-old, who had been unable to play in pre-season due to a side strain, was impressive in an 80-minute effort. "I know what I'm capable of out there and do it but until you actually do it it's a whole different story," said the England international. "I just went out there to play my game and kept it as simple as I could. That's where I get my confidence from really." Canberra are 11/1 to win the grand final this season and 59/50 to win their next game against the Storm, who are 18/25 to triumph.